After a total refurbishment of their library, Okaihau College is enjoying the fruits of their labour. Library and IT staff are thrilled with the beautiful new furniture and interior design while students and the wider school family is just as proud of their new learning centre. It really is a modern multipurpose learning environment for the whole school with fantastic dividing partition areas can be closed off for seperate use. 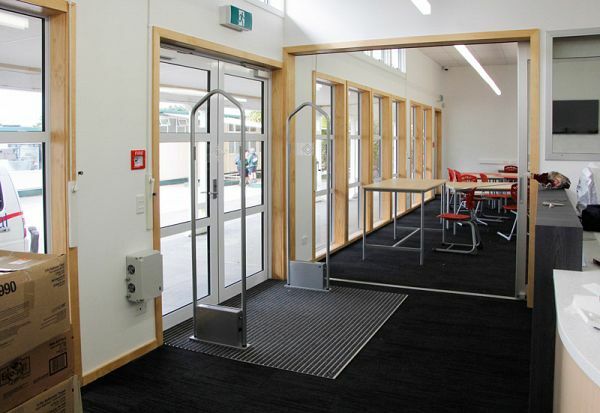 Okaihau College is a state secondary school (year 7-15) with a role of 437 students, and Library Plus is proud to be involved by providing and installing a cost effective RFIQ™ library book security system that could be tailored to their needs. The modern sleek silver M180 gates / antennas really compliment the interior design of the library. One important need was for a wide double door entrance specifically for wheelchairs. Normal EM tattle-tape systems commonly found in schools today can only offer up to 1200mm max where as our M180 RFIQ™ antennas were able to reach a massive 1600mm! Problem solved and doesn't it makes the entrance so much more open and inviting. Since installation in May, library staff have gained a complete faith in the new RFIQ™ system. It has been working perfectly since install with not a single false alarm and picks up unissued books with incredible accuracy. The convenience of the hidden staff pad makes issuing and receiving books as simple as a mouse-click. Congratulations to the Okaihau College team for such a fantastic library! We're looking forward to supporting you for many years to come. In April 2014 the new Okaihau College Library/Learning centre was opened. As this was a new build we decided to replace our old style magnetic security gates for a new system and after research into various products we settled on the RFIQ / RFID Security Gates from Library Plus. It’s now December and we haven’t had a single problem or one false signal from it, unlike our old dinosaur. 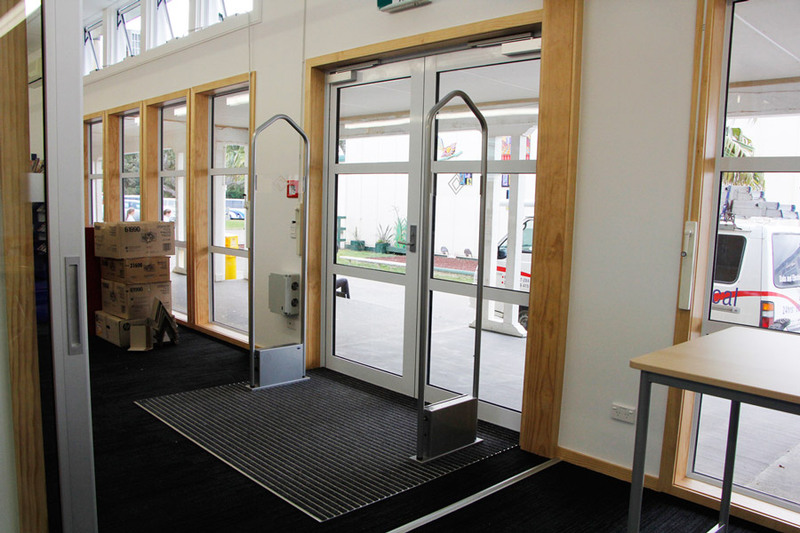 The unit was installed without any problems even on the aluminium floor mat and because of its design we were able to have the gates 1600cm apart which enabled us to cover the full double door entranceway and provide better access for wheelchairs. The RFID labels were a snap to add to our existing and new stock, even the wireless keyboard for the TV has a RFID label on it. The software was installed remotely in advance of the installation and is a breeze to use. The RIFQ Staff Pad was installed under the issuing desk and preforms without a hitch even thru a 50mm thick desktop. The ability for the Library Plus team to access the unit via the internet for any maintenance is an added benefit. We highly recommend these products and cannot praise Steve Sussex and his team at Library Plus enough. 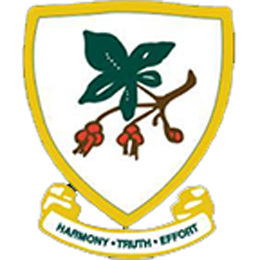 If you wish to contact us please do not hesitate to phone the College on (09) 401 9030.